Oddly enough, the twentieth century may turn out to have been exceptionally burdened, in the arts, by dogma. The period that saw the rise of the New York School abounds with the injunctions and interdictions of countless ideological scrimmages. 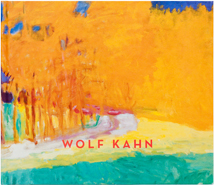 Yet, for over half a century, Wolf Kahn has maintained a calm self-possession amidst these raging polemics. As a young artist studying with Hans Hofmann, he thoroughly digested his teacher’s explanations of pictorial dynamics, but, like Bartleby, he preferred not to give up figuration. Indeed, in an era of polemical abstraction, he committed himself to landscape with blithe Postimpressionist aplomb. From virtually the beginning of his career, his art has fused the twentieth-century’s insistence on the primacy of the medium while exploring the traditional pleasures of the observed and transformed subject. Getting to that point can involve an arduous give-and-take. He often starts with sketches and memories he feels free to change anyway he likes. Meanwhile, he keeps looking at the developing image until, as Rilke might have put it, it begins to look back at him. In this way Trees in a Magenta Light (1991, page 29) eventually disclosed his true subject as the dark blue mass of trees hovering in the lower left and moving into the distance of the hills. In drawing with color he simplifies the remembered natural forms so that they can reveal their inherent visual tension and drama. The point is never merely to record or depict what he has seen. Instead, for him, the natural fact supplies the pretext for harnessing nature’s own infinite formal inventiveness to the discipline of modernist visual syntax. Sometimes the result is candidly figurative; sometimes he takes us right up to the threshold of abstraction. Most often, Kahn arrives at an ambiguity in which the figurative and the abstract are virtually indistinguishable from one another. Moreover, for Kahn, it isn’t only formal questions but what the English poet Gerard Manley Hopkins called “inscape” that fascinates him: the drive to turn the seemingly random, fugitive glance at no-place-in-particular into a visual whole stamped at every point by its own ineluctable essence. This compulsion to discover the inner coherence of the fleeting impression is made explicit in the title of Order in Disorder (2001, page 27), to what Novalis, in a favorite saying of Kahn’s, called the “order that should shimmer through the veil of chaos.” In this painting, the vigorous web of painterly strokes draws the eye inward toward the strips of yellow ground that hint at deeper, further webs in the distance. Young Cypress in Corkscrew Swamp (1997, page 26) presents a field of verticals framed by a light green splotchy band at the bottom edge and darkening accents at the top, its wispy crosshatched strokes both opening and occluding light. In Vermont Tangle (2003, page 15) a thick curtain of trunks and branches again invites the eye to explore the hills and sky beyond the trees themselves. In all of these, Kahn derives rhythm from randomness and containment from chaos. Although many of his paintings are of uninhabited, almost “no place” places, we see his fascination with human geometry in Three Barns in a Row (2001, right), in which big solid New England primary forms hunker down in a scrubby foreground; we cannot miss the small barn that anchors the picture plane in Web of Trees (2003, page 25) and concentrates the painting’s sprawling wilderness of syncopated “all-over” splotches of brilliant yellow, orange, pale violet and green. Kahn has reached the point in his work where everything is available to him. We can overhear, as it were, his lifelong dialogue with masters such as Ruisadel, Corot, Turner, and Bonnard, and share his joy in landscape as pure earthly delight in Country Road with Maples II (1997-2004 page 9), the largest painting in the show and a sumptuous image of autumn at its peak: maples burning a fiery orange, the sky a brilliant blue. The color reaches a luscious saturation as reds, blues, greens, and oranges chart the curve of trees into and around the bend in the road – a classic route into depth and recession. The contrast of yellows, purples and pale greens in Early Autumn (2004, page 21) is more austere and subdued in its range of hues and tones, but here too we are invited to lose ourselves in woods that are, in Frost’s words, “lovely, dark and deep.” Kahn’s color is both the foundation and the luxury of his art. It is always vibrant rather than flat, but can range from sharp bursts of chromatic intensity to tonally varied massings, especially in the thicket and bramble paintings. Above all Kahn’s color evokes memory and desire, as in Reaching Skyward (2002, page 18). With its oranges, violets, pinks and reds, it recalls America’s first poet, Anne Bradstreet, who in the seventeenth-century marveled at the same autumnal colors in her adopted New England. At the same time, while Kahn’s chromatic landscapes evoke an almost paradisal pastoral world, his woods and thickets often strike a very different key. In 2001 he traveled to Namibia with his daughter, where he saw stands of white thorn so dense, as puts he it, “that even elephants can’t get through it, so dense that you can’t see the ground.” The paintings resulting from this experience are complex, formally, closer to Pollock than they are to traditional landscape, and consumed with the teasing and forbidding lure of the unknowable. In Mostly White (2003, page 10) there is a hint of horizon in what is otherwise an “all-over” density of scumbled, interwoven strokes; a similar image informs Long Landscape (2003, page 20), with its whitened divisions of yellow and gray. With Yellow Tree Amid Grays (2004, page 11), we can just make out a hint of yellow foliage through the layers of feathery strokes that simultaneously court and bar the eye. Again, it’s not a question of literal place, but of finding the ineluctable whole in the visual tangle. The long pole of the tree trunk in Seen in Florida (2003, page 19) more or less “unlocks” the tight surface of infinitely interwoven strokes. Similarly, Woodland Swamp (2004, page 17) recalls Bonnard in its violet-silvery tonality, in which softened and mottled daubs of paint filter the soft shimmer of light through the trees stripped bare of leaves. When we speak of mastery in art, what we really mean is freedom: the experiential toolkit made of up technical control, self-knowledge, and fearlessness with which the artist can do whatever he sets out to do. It should not be confused, however, with expertise, which amounts to doing what one already knows. It is, rather, the equipment necessary for facing the unknown. In his recent paintings, Kahn continues to give himself the widest possible berth to confront what, in each painting, is essentially a new problem, that of actually finding the painting and giving it the time and space to turn itself. He does not know, when he starts out, where he will arrive. Each work is thus an adventure, a quest for an equation without a formula. Finally, the gorgeousness of Kahn’s paintings are not simply ends in themselves. In those silvery thickets he struggles with elemental mysteries, while his luscious color assuages all that would violate and destroy the splendor of life. What moves us in his paintings is thus Kahn’s addirmations: of everything that grants us victory over disorder, or everything that makes us human, of everything that brings us peace, pleasure, wholeness and joy in the uses and discoveries of the senses. *Conversation with the artist. June 2, 2004. New York City.